President Jimmy Carter will discuss Ebola, democracy, human rights and public health in a free event April 9, part of Emory’s ongoing Ebola Faculty and Community Discussion Forum. The discussion takes place from 2:30-3:45 p.m. in the Woodruff Health Sciences Center Administration Building auditorium, located at 1440 Clifton Road. A reception will follow. 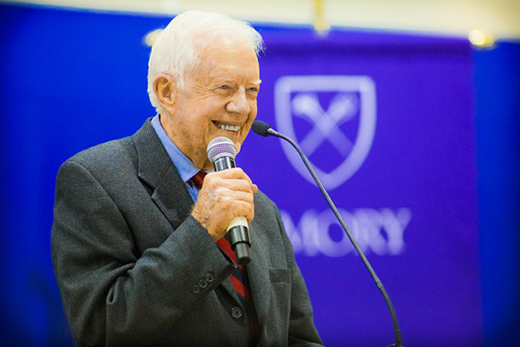 Carter, the nation’s 39th president and University Distinguished Professor at Emory, is founder of The Carter Center, an Atlanta-based nonprofit dedicated to "waging peace, fighting disease [and] building hope." The Carter Center is an affiliate of Emory. In August, Emory University Hospital gained worldwide attention for treating the first patients with Ebola virus disease in the United States. During the fall semester, the hospital cared for a total of four Ebola patients, and Emory physicians shared their protocols with health care providers around the world. The Ebola Faculty and Community Forum was created to offer an extensive, multidisciplinary forum to explore the impact of Ebola virus disease on public health, policy, law, ethics, government, development, religion and more. "Emory is committed to knowledge in the service of humanity," says Sita Ranchod-Nilsson, director of Emory's Institute for Developing Nations, who co-chairs the forum with Deborah Bruner, Robert W. Woodruff Chair in Nursing, and Pamela Scully, director of the Center for Faculty Development and Excellence, assistant vice provost for academic innovation, and professor of African studies and women's, gender and sexuality studies. "Here we have an opportunity to cross disciplinary boundaries, and also boundaries that often separate professional fields, to address a health crisis in West Africa that has truly global implications for all of humanity,” Ranchod-Nilsson says. The forum, comprised of seven discussions, began Jan. 26. The April 9 discussion with President Carter, as well as the opening and closing sessions, are open to all. For other sessions, students, faculty and other members of the Emory community could attend the first hour, from 4-5 p.m., while a second hour was reserved for a small group of faculty who were selected through a competitive application process. Video footage of previous Ebola forum sessions is available here. The forum is organized by the Institute of African Studies, the Institute for Developing Nations and the Nell Hodgson School of Nursing. All nine schools that make up Emory University have lent their support. The forum concludes April 13 with “Ebola: Moving Forward on Research, Curriculum, and Global Partnerships,” set for 4-6 p.m. in Tull Auditorium of Emory Law.